Gameplay programmer Paul Mertens doesn’t like menus. If you want something done in Interstellar Rift you will have to talk to the spaceship’s systems directly. “The main goal of Interstellar Rift is building a spaceship from scratch, being able to walk around and to interact with its systems. The team of Split Polygon attempts to create an immersive space simulator where the player feels as much connected to their ship as possible. To achieve this, all gameplay elements are incorporated into the game as much as possible. Instead of going through abstract menus, the player interacts with the ship’s systems directly and controls these systems through interfaces placed directly on the device in the world. This direct interaction breaks down the barrier between the game and the player, that a normal screen space GUI menu would enforce. The device reacting to the player’s input by animating and making a sound completely sells the interaction between the game world and the player. These interfaces also help the player to learn about the game. When the player approaches the terminal, it automatically turns on. The animation and the sound immediately grab the player’s attention. As they only contain information and functionality about the device it is attached to, the device interfaces don’t overwhelm the player with information and efficiently teach the player what the device can do and how it is used. Level design –the only part of the game that is either randomly or user generated– also reflects this learning curve. 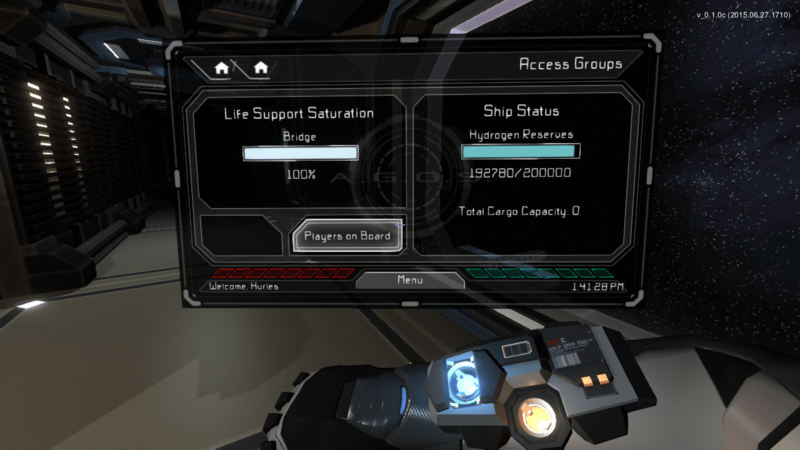 On the starter station the player finds two devices he can interact with: the ship editor terminal and the teleporter. The ship editor terminal will tell the player it can be used to build ships, but requires resources. The teleporter teaches the player to hop between ships and that one of these ships is called the mining station. This process of learning the game feels like an adventure where the player searches for ‘things to interact with’ where a flat tutorial would feel like a chore. Paul Mertens is gameplay programmer on Interstellar Rift. Together with four other students of the International Game Architecture & Design programme in Breda he founded Split Polygon.